 A personal journey of Jewish spiritual renewal in dialogue with the Dalai Lama. Summoned by the Dalai Lama to Dharamsala, the retreat in northern India that the Tibetan exile community has inhabited since the Chinese invasion of Tibet in 1959, a group of eight Jewish leaders goes to India for a week of discussions in order to teach the Tibetan spiritual leader what the Jewish tradition has learned about religious self-preservation. 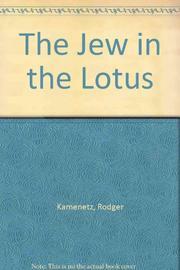 Jewish poet and designated eyewitness Kamenetz (English/Louisiana Univ.) comes along for the ride and on the way learns about the richness of his own Jewish identity by hearing about its similarities to Tibetan Buddhism. Familiar with survival in the face of exile and near-annihilation, the Jewish leaders, mostly rabbis, communicate their wisdom to the Dalai Lama. While we are prepared for a two-way exchange, Kamenetz tells us mostly about the rich, contradictory life of modern Judaism: from the Orthodox Irving (``Yitz'') and Blu Greenberg, who are concerned with maintaining the purity of religious observance, to the kabbalistic Zalman Schachter-Shalomi, who, as a leader of the Reconstructionist movement, unites the esoteric traditions of Jewish mysticism with a post-1960s eclecticism. At the heart of the book is an exchange between Schachter-Shalomi and the Dalai Lama about the nature of angels and reincarnation, during which the Jews and Buddhists present realize the close parallels between their traditions. The large number of ``JUBUs,'' Jewish Buddhists (including Allen Ginsberg) Kamenetz encounters leads him to question the problem of some American Jews' conversion to Buddhism in response to what they perceived as Judaism's closed spiritual door. But as the reader discovers, the Jewish esoteric tradition, including specific spiritual practices such as meditation, is available to the ardent seeker. A highly entertaining personal account of one man's surprising journey into the mystical heart of Judaism.